Located on Koh Samui, the third biggest Thai island, Top Cats is just one of the many attractions on the island. This is an island that really comes alive at night, but if you are looking for activities during the day, you will have the chance to catch some of the biggest fish and most exotic species you can hope to find in Thailand. With over 30 different species and over 4,000 fish on offer, there is going to be something for everyone at this resort, that ensures you can relax or party to your hearts content. There is a strong focus on fishing at Top Cats but there are also bars and pool areas if you want to party, making this the perfect sort of fishing destination for the people who flock to Koh Samui. Given that many people go to a fishery to try and catch the biggest fish in their life, it is good to see that Top Cats provides a specialist Arapaima area, which has been found to have been the most effective for catching this style of fish. If you are serious about catching the sort of fish that you had never seen before, and likely won’t see again, the layout of the Top Cats fishery is well worth checking out. There are also five sixty year old teak Thai house boats, offering a grand place to stay. The look of the houseboats is traditional Thai, but they have been kited out to the finest of Western standards, offering you the best of both worlds. There are over 100 Arapaima to look out for and the largest stocked fish is over 330lbs. 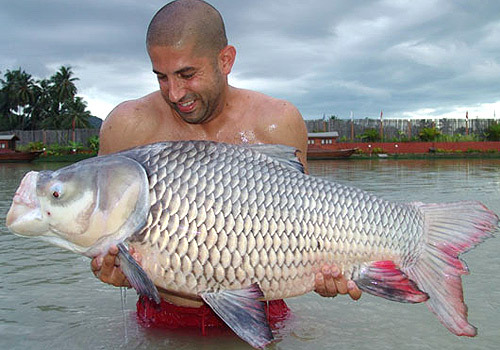 Other big fish to look out for include the Giant Siamese Carp, with a lake record of 170lbs or the Julian’s Golden Prize Carp, with a lake record of 55 lbs. Other fish to look out for include the Catla Indian Carp, with a weight of around 55 lbs and the Rahoo Indian Carp, of around 40lbs. There are at least 65 fish with a weight of over 100lbs to look out for at Top Cats, which should ensure that there is plenty of big fish to go round. The Poachers Paradise Restaurant offers a wide menu, containing Thai and Western food and if you like a social vibe when you dine, there are regular barbecues and buffets to look out for. The restaurant also regularly welcomes guest chefs who are more than happy to serve up themed food nights. There is also The One That Got Away Bar, which has satellite TV’s beaming in sport, movies and news from around the world. There are pool competitions and pub quizzes on offer as well as a stunning selection of draught beer. When you think that the bar has its own pool where you can laze all day, this is definitely the sort of resort to head to if you look to combine fishing with fun. Accommodation is available on site and starts at £40 per night per room. For a good night out on Koh Samui, make your way to Chaweng and Lamai, where you will find every sort of bar and club waiting for you. If you want to have fun at night after fishing all day, these are the resorts to visit. The Samui Aquarium takes things a little bit slower and if you want to see some of the best fish in Thailand, this is a great way to while away a few hours. The Snake Farm is located close to Top Cats if you want an attraction with a bit of a difference, get up and close with a massive array of snakes.